Back row more balanced but that does not look good for Hughes at all. Sorry to see Hughes go off but finally we have some pace in the actual pack! George was very silly there, England still had the advantage and were in a good attacking position. Where was the offside for that pen? Heaf wrote: Where was the offside for that pen? Was for a high tackle by Itoje I think. I actually think that Ford should be taken off, Farrell to 10, Teo to 12 and JJ to 13. I think that would give England more attacking threat right now. Oh, yeah I didn't see any offside there. Still waiting for a decent half of rugby from England this campaign! Next week isn't going to be pretty, unless you're Irish. eirebilly wrote: George was very silly there, England still had the advantage and were in a good attacking position. Silly? Totally braindead more like. We can't afford to blow attacking positions with stupidity like that. Need to cut the penalties out. Silly mistake killing england with ball in hand not the ref. England really have to score a try here to have any chance of keeping this championship alive. Winninghr game not the champions important billy. eirebilly wrote: England really have to score a try here to have any chance of keeping this championship alive. No 7&1/2 wrote: Silly mistake killing england with ball in hand not the ref. 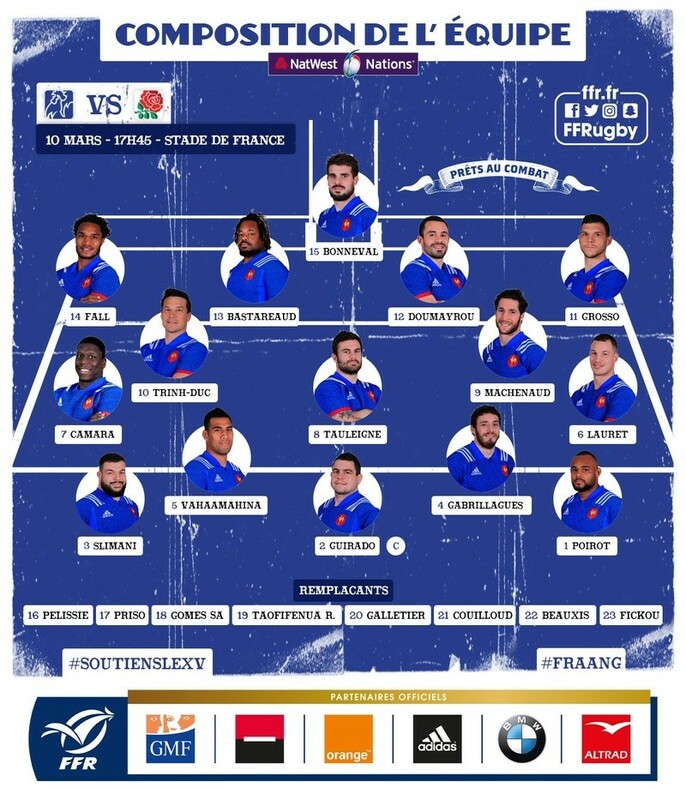 France being allowed a yard or more offside at every ruck while we get pinged instantly is not helping. Brill the traditional lawes can't hold the blooming ball moment. Well on thst one....Grand Slam in the bag for Ireland next weekend! Absolutely dire and unimaginative half from England. Very poor indeed. As I said earlier, Farrell to 10, Teo to 12 and JJ to 13. Ford, for all his attacking prowess is adding nothing to the England attack. Tournament over and we get worse every game. Can forget the World Cup. Well that wasn’t pretty. Starting to look a bit like France-Ireland game. French defending ok and England attack looks a bit toothless. France are nothing special, but I'll have a little punt on them at halftime at 5/2. Don't worry scott lawes won't be playing 6 by then. Players will be back from injury. eirebilly wrote: Absolutely dire and unimaginative half from England. Very poor indeed. Agreed, Ford is just baggage again. Te'o is looking busy but needs to be inside and on the ball more making space for JJ and the back 3. No 7&1/2 wrote: Don't worry scott lawes won't be playing 6 by then. Players will be back from injury. Even worse without his 2/3 lineout steals. I'm not sure Eddie even sees the issue, but it's everyone's responsibility, including the players trying to make an extra metre without support. That's a question in second row surely. You could play lawes Itoje as the lock for that. As I stated earlier shores up setpiece bur not sure it negates the breakdown. Laws the perfect bench option hough. Breakdown isn't one player though, it's coaching. We don't even compete and never get clean ball. That won't be solved with one personnel change. No 7&1/2 wrote: Gf you're too pessimistic. I'm not mate, I'm just a very realistic person. Attack looks ponderous and in-dynamic. And hopefully now he proves me wrong with a huge carrying and clear out 2nd half. Scottrff wrote: Breakdown isn't one player though, it's coaching. We don't even compete and never get clean ball. That won't be solved with one personnel change. Spot on mate...its the tactics. No pen for falling over in front of advancing maul? England are putting two men in the breakdown, clear outs....they got smashed doing that two weeks ago. Ireland will rip them a new one next week. Why are they NOT ADAPTING. They have to put MORE men to secure the ball. F^%k fast ball...its not good if you keep losing it at the breakdown! England need to make changes very soon, France are building momentum. It is a high tackle but not as bad as it looks. Probably see a yellow card though. Chance of a penalty try? Wow that was very harsh.